I am 24 years old… I have 3 wonderful sons (ages 6, 2, and 8 months), each a very bright light in my life. I suffer from fibromyalgia… and now, possibly MS. I am constantly going for more tests. Why? Why did this happen to me? 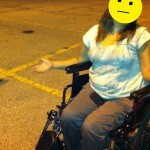 Why did I become partially paralyzed? 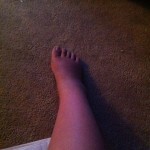 Why can’t I feel my foot, or use my leg the way I want to? Why can my 98 year old great-grandmother walk faster than I can? Why did it have to be me? 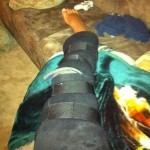 I cry at night… mourning the loss of my leg’s usefulness. I need to have it back to the way it was to feel better. Most days… I go through the motions of what is expected of me… I cook, clean and tend to my children… but it’s not heartfelt, it’s all just actions that I have no real feeling for. I smile so that my family doesn’t worry. I hide the tears because I don’t want them to get upset. I am trying so hard to cope. It’s been 8 months. 8 long, sad months since I’ve been “normal”; and I am so tired of the act that I just want to lay in bed and cry. My journey to being healed has been long, frustrating, and painful. You see, I can’t USE my leg properly… but I can certainly FEEL it. There are “Feeling Nerves” and “Doing Nerves”… the “Doing Nerves” aren’t getting the message, but the ones that feel are, and they’re protesting every little thing that I do. My life is pain. My days are measured by “good days” and “bad days”. More often than not, it’s a “bad day”, every now and then I do have a nice and easy “good day” where my pain is down enough for me to take my wheelchair, and go across the street to drop my son off for school. The other days, I have someone else take him. 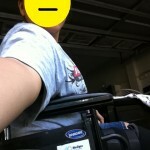 I do use a wheelchair for when I’m going to be on my feet for longer periods of time. If it’s a short amount of time, I put my brace on and use a cane. I’ve graduated from an old lady’s walker. I’m only 24. This isn’t fair. Sometimes, when I’m alone, I scream. I scream in pure fury and frustration. It’s a very “raw” type scream that’s full of emotion, which usually ends in me crying more. I am trying so hard to keep myself happy, but its getting harder and harder to paint on a smile every day. This is the hellish life that I am living post-baby. I should be happy, but instead, I am just a broken shell of the woman I once was. Quite possibly because “they” told me that I would be better by now; that I would be back to my old self, running and wrestling in the green grass with my sons. The way my life should be. i cant say i know what your going thru cuz i dont.. i have a 5 yr old daughter 2 yr old and 6month old son. i to am 24. when i was 12 i had back surgery do to scoliosis and have horrible back pains. My joints are awful my lower back wrisits hips ache all the time i cant pick my kids up or play with them the way i want to.. i too get so mad some times and ask why me why do i have to suffer ALL the time i just want to be a mom.. after my last baby was born i cud barely walk without shooting pains in my hips and back i wud fall down and cry then i cudnt pick my new born baby up with the fear of dropping him cuz my wrists are so weak.. idk what my pain is from but know one can give me answers and tell me to take tylenol ibp or aleve really i need help i feel depreased and so lonely some days but others are good.. if you need a buddy let me know maybe we can be there for each other!! You are stronger than many women out there, even on your weakest day. Keep strong and don’t feel afraid to talk to someone if you need to. Everyone needs someone to confide in.